Until 1964, there was no Gurdwara in Bradford. 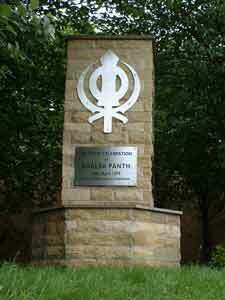 This meant that Sikhs in Bradford would travel to attend the services at the Chapletown Gurdwara in Leeds. In 1964, the first Gurdwara in Bradford was founded at 16 Garnett Street. A management committee from the sangat (congregation) was elected to have day to day management responsibilities for this Gurdwara. In 1965, the management committee decided to build a new Gurdwara and a plot was bought on Malvern Street / Ventor Street. At the same time, Prospect Hall on Wakefield Road was suggested as an alternative location for the new Gurdwara. Because of disagreements within the management committee on whether to continue with the construction of the new Gurdwara or to purchase Prospect Hall; It was finally decided in 1970 that the then management committe would be disbanded and two new associations would be established. The United Sikh Association would continue with the construction of the new Gurdwara at Malvern Street and the Bradford Sikh Association would purchase Prospect Hall and had it renamed The Gurdwara Guru Nanak Dev Ji. In 1970, construction was started on the Guru Gobind Singh Gurdwara at Malvern street. It was formally opened in 1972 with the Lord Mayor of Bradford, the Indian High Commissioner, local MPs and the Sikh sangat (congregation) attending the opening ceremony. In 1975, additional land was bought for a car park along with a small building that now houses the Punjabi Language School. In 1985 a new Diwan Hall was built and in 1999 an extensive rebuilding programme took place when a second Diwan Hall was built along with a larger Langar Hall. The book “Sikhs & Sikhism in Britain fifty years on, the Bradford perspective” by Raminder Singh was used to produce this history of the Guru Gobind Singh Gurdwara.